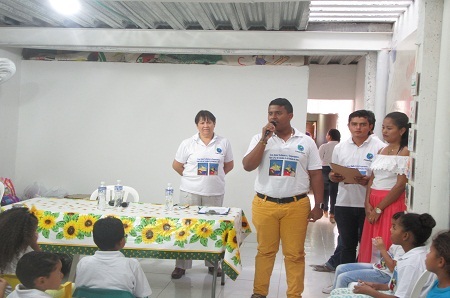 The Magdalena Foundation, Inc. (MFI) welcomed four new students to the program: Salvadora Bornachera to study cuisine, Jose Antonio Bolivar, anthropology, Anuar Sepulveda, computer systems and Maria Rey, fashion design. Ana Rey brings an unusual change to the program because she is an adult who lost her land and family and was left with a six months old grandchild. She came to Santa Marta and met Alba Lucia Varela, our program director, who convinced her study. She could not read or write. With lots of obstacles, she graduated from elementary school and with honors from secondary school. Because of her work as a leader in her community and accomplishments, as a seamstress, she was accepted at a local institute for fashion design. MFI will help her during three years until she graduates. Last year, Jeferson Rios Olivares graduated as an Electrical Technician and will be fully employed in September, when he becomes an 18 year old young man. In March, Sindy Paola Barrera and Vanesa Jimenez will graduate as pre-school teachers. Thirty four children of Paso a Paso received their school backpacks full of school materials and two pairs of shoes. Please visit our gallery to see some photos of the ceremony and thank you for your support.